start the tomato sauce. bring a large pot of water to boil. score the bottom of the tomatoes, blanch in the boiling water for about a minute, cool and peel. discard skins. roughly chop tomatoes and set aside. in a small saucepan, sweat the minced onion and garlic in about a tablespoon of olive oil over medium low heat for about 5 minutes, until soft. add the tomatoes to the onion and garlic. if you want a thin sauce like mine, blend the sauce with an immersion blender. cook about 15 minutes until thickened. 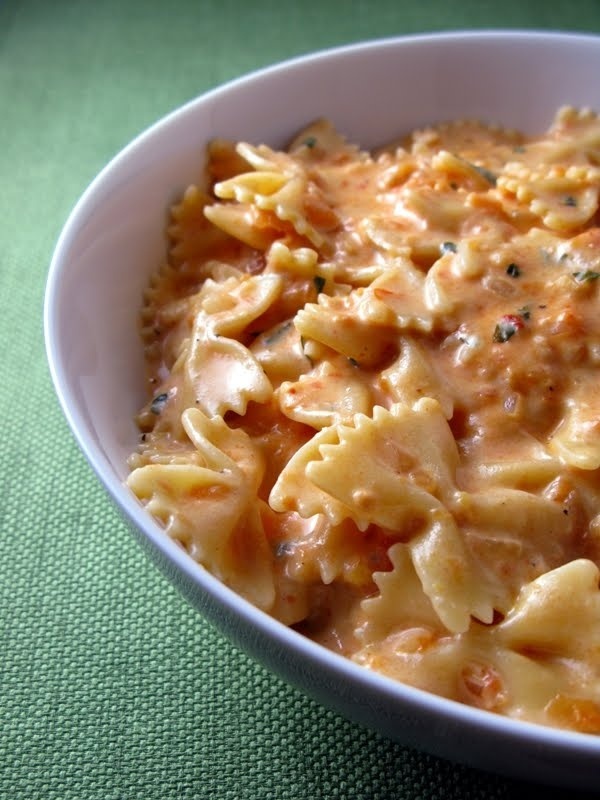 while the pasta and tomato sauce are cooking, make the alfredo sauce. melt the butter in a saucepan over medium heat. whisk in the flour until smooth and cook about 2 minutes, until brown. whisk in the milk, half & half, and garlic and season with salt & pepper. continuously whisking, bring to a simmer and cook about 2 minutes until thickened. fish out the garlic with a slotted spoon and discard. whisk in the parmesan. the sauce will be very thick, so add 1/3 cup of the hot pasta cooking water to the alfredo sauce to thin it out a bit. remove from heat. drain the pasta and add to the alfredo sauce. mix the basil into the tomato sauce and add the tomato sauce to the pasta. mix well. could you make it without half and half?